I call Mike Payne in the Monaco office of Camper & Nicholsons who confirms that he's signed the central agency for sale of the 26m classic motor yacht Solaria Too. Built in mahogany by France's renowned Esterel yard in 1973 to a Jon Bannenberg design, the luxury motor yacht sleeps eight guests in five cabins and her large deck spaces make her ideal for Mediterranean cruising. 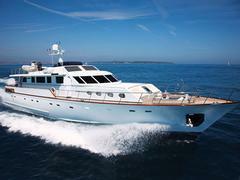 Says Mike, "In 35 years Solaria Too's had only three owners - a testament to her quality." Available for inspection in France, the megayacht's asking €1.3 million.